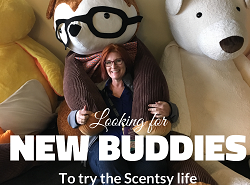 Is Your Scentsy Business in a Funk? Ever hear a fellow consultant say, “I’m in a funk”? I think we all get the idea of what that means when we hear it. Basically that something isn’t quite right; nothing seems to be going well; in a slump, right? Songwriter Steven Greenburg wrote the popular “Funkytown” when he became bored with Minneapolis and wanted to move to New York. Some of the lyrics go: Well, I talk about it, Talk about it, Talk about it, Talk about it, Talk about, Talk about Talk about movin…” If you don’t remember that song – ask your parents! Me: What are you saying to potential hosts? Then we go into a conversation about how hosts don’t do consultants favors. The consultant has a fabulous product he or she wants to share and give others the opportunity to earn free items. Actually the consultant is doing the host a favor. It’s an important change in mindset. Me: What else are you doing for your business? DL: I’ve talked to everyone I know. Me: What have you said? Notice a pattern of evading my questions? Me: Have you called your past customers and hosts recently? DL: I sent a text. Me: Have you called your past customers and hosts recently? Just let them know what the current specials are and tell them that you’re placing an order and ask if you can them anything. Me: Okay, tell me what you’ve been doing that isn’t working since we last spoke. DL: I’ve done everything you said and nothing works. Me: Oh my! Everything? 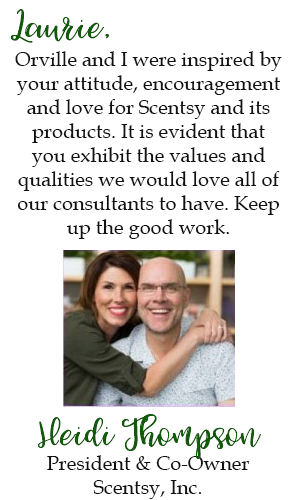 Do you meet your goal of talking to three new people a day and give them a sample and catalog? Have you called all of your past hosts and customers? Have you asked everyone you know, including family and friends for referrals? Not for sales, but for referrals – either someone who likes candles or who may be interested in earning some extra income? Still Me: Have some you done sample test mailings with your catalogs and samples? How many business cards have you given out this month? Have you blogged regularly? How about writing some articles? Did you read any books on search engine optimization? Are you contributing to social networking such as Facebook, Twitter, Pinterest, YouTube, Snapchat, Tumblr, Instagram, LinkedIn and others? Still Me: Have you created or outsourced the design for an external website? Did you try to get incoming links? Is the text on your replicated website current? Have you approached businesses about setting up a display? Have you located and participated in any Vendor Events? Have you attended any of the telecons, webinars or meetings? Are you planning to go to convention or the regional training? Do you have a decal or magnet on your car? Have you approached any organizations about doing a fundraisers? Have you done any target marketing? Have you defined your niche? Have you considered your unique selling proposition? Have you created any videos, slideshows or podcasts? Yup, Still Me: Do you carry your products and recruiting information with you everywhere you go? Either in your purse or available in the vehicle? Have you offered any contest prizes or donations to anyone? How many samples have you handed out this month? How much time a week do you spend on your business? Have you phoned anyone within the last three months for help or accountability? Have you written down your short and long term goals? Do you have a vision board? Are you working just your immediate geographic area or are you going nationwide and international in your effort? Have you reread the manual and listened to all of the available training modules? Mercy, you’ve done ALL OF THAT, and you’re still in a funk? Eek. Have you considered that perhaps Direct Sales isn’t for you if you’ve done everything listed above and still can’t get one sale? Okay, yes perhaps there is a little sarcasm there and no, I would never barrage a downline member like that. Well not all at once anyway! And I’d do it nicely while offering support. I think you get the point. If your business truly is in a funk, try some of the suggestions above. You should be able to see some improvement. Or if you keep saying that “you’re in a funk” but cannot honestly say that you’ve done EVERYTHING, then it’s time to step out of your comfort zone and get out of Funkytown! 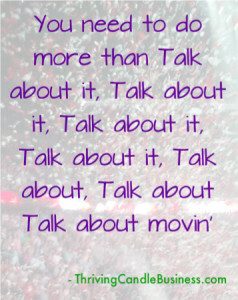 Don’t just talk about it, Talk about it, Talk about it, Talk about it, Talk about, Talk about Talk about movin“¦ Instead actually GET Movin! Please Like, Share or Post a Comment! Why Are You Sabotaging Your Business? Because this has played out countless times with consultants, who wonder why nothing is happening yet they do nothing. Your whole blog was like deja vu for me! You rock, hopefully those who read this will really READ it and APPLY it! You are so right about folks always complaining about not getting any sales but not really doing what they need to do to get the right results. Hopefully people in direct sales with this problem will take your advice.